According to the most recent census data, there are nearly 160 million more white people in America than there are black people. White people make up roughly 62 percent of the U.S. population but only about 49 percent of those who are killed by police officers. African Americans, however, account for 24 percent of those fatally shot and killed by the police despite being just 13 percent of the U.S. population. Therefore, blacks are 2.5 percent more likely to be shot by police officers than whites. There goes your point. That would be a good point if not for the fact that there are almost six times as many white people here as there are black people. So murders by cops are justified only when the victim is white? Or are you saying it is to be expected due to their high population? If it is the latter then we would expect black people to make up a lower percentage of crimes and murder in the USA but sadly they do not. They commit about 38% of all murders, about three times more their population percentage, while white people commit 31% of all murders which is about half of their population percentage. If you accept that black people are disproportionately murdered by the police then you must also accept that black people disproportionately commit more murder. Is that what you got from what I wrote? The fact that more white people die from police doesn't disprove racism when there a lot more white people in the country. That's all, and it's pretty undeniable. To your point, sure. But since you're already conceding that we're talking about police murders here, the other crime stats are irrelevant. A murder is by definition unjustified. Why doesn't it disprove racism? If a cops are undeniably racist we would see a lot less white murders by cops relative to their population size, but we don't. And to the other crime stat what I was getting at was that black people have more interactions with the cops in general than other races relative to their population size. Which could be a factor in the number of black people killed by police. In short more interactions with police due to committing a crime equals an increased chance of getting killed by police. In truth what I am against is the selective outrage some people have over this issue When 90% of all black people murdered are killed by other black people from their own community but nobody seems to care about that because it does not have a racist spin to it. And anyone who tries to speak some reason or against this BLM movement will just get labeled as a racist. When a cop shoots a black person, justified or not, I do not believe it is an issue of systemic racism. I believe it just shows how poorly trained some cops are and how poorly suited some cops are at handling their job. 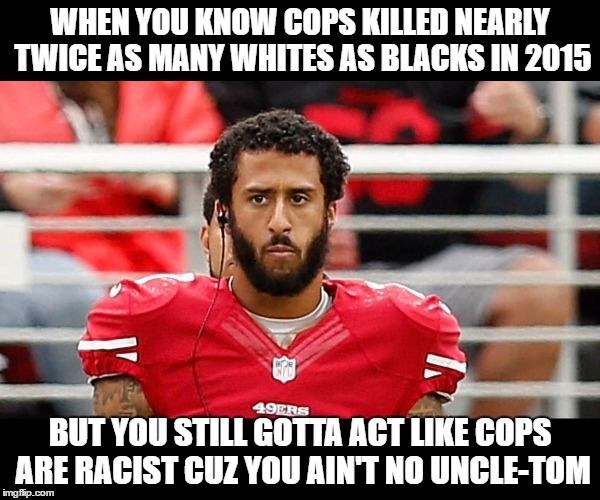 No need to label cops as racist, they are in fact just people from are own communities trying their best. Racism doesn't have to be the only thing on play. Cops do defend themselves, and that can be expected to override racial prejudice. Not all of them have to be racist for racism to have a noticeable effect on the numbers, either. The point has always been that the meme's argument is invalid, that's all.